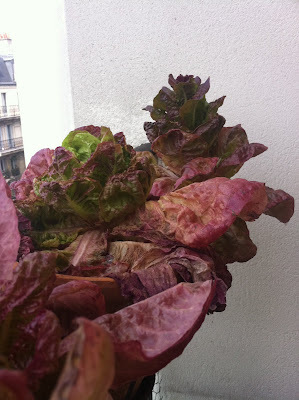 Sprouting and Branching Out: A Balcony Update. While my presence on the cyber page has been scarce as of late, I've still been keeping up with my paris paysanne habitudes in unpublished activities. Summer is setting in, with a nice mix of salsa inspiring sunshine and sprouting seedlings awakened by scattered showers. My balcony is in bloom, with two cherry tomato plants I bought at Marché Batignolles doubling in size each day. Our grape vine is back with its beautiful green leaves but no grape bunches yet. We've also been dining weekly on my little salad harvests, they provide nice greenery for our ritual pizza parties. Our window box herb garden has expanded to include not only basil but mint, thyme, rosemary, and chives. And, in probably my most exciting addition, this week brought with it the first sprouts of cucumber plants that are from seeds that lovely Solange brought back from Ireland for me! I hope that my cukes will be healthy and fruitful because I'm planning on using them for both this great cucumber kimchi recipe that Céline sent me as well as combine them with my grapevine and brine to make some delicious dill pickles. Like my tomato plants, I have also branched out and become an "amie" of the Jardins du Ruisseau, which is the community garden in my neighborhood that inhabits the abandoned railroad tracks near St. Ouen. I just signed up today, but I can't wait to see what this new membership will bring into my life and am looking forward to sharing my experiences on the blog! 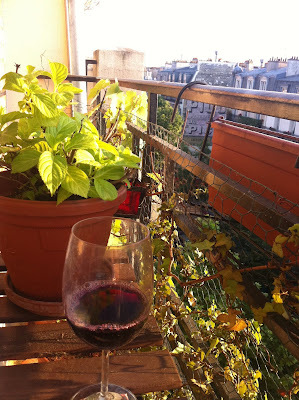 This little balcony and blog status update has allowed me to look back on some fun projects of the past and look forward to tons of new DIY adventures. I'd love to arrange to some collaborations in the future as well, so if any of you have ideas for posts or want to guest blog, please get in touch! Otherwise I'm looking forward to writing about my experience working with community gardens, finding new marchés du mois, and producteurs to profile, as well as posting about my DIY projects for me and monsieur's wedding in August 2012! Let me know if you're out there, paysannes de Paris, then I'll send a personal note apologizing for my absence next time! Until then, stay biodynamique! Beer Me in Gay Paris!